The Chinese and Australian foreign ministers held the two countries’ highest level bilateral meeting in China this year. 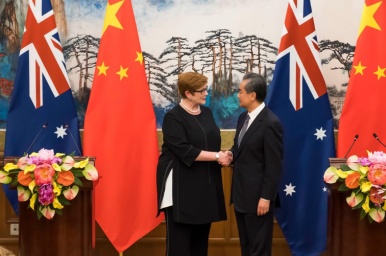 From November 7 to 8, Australian Foreign Minister Marise Payne visited Beijing, meeting with her Chinese counterpart Wang Yi for the fifth Australia-China Foreign and Strategic Dialogue. This was the highest level bilateral meeting between the two countries held in China this year and also the first time an Australian foreign minister set foot in Beijing since former Australian Foreign Minister Julie Bishop visited China in February 2016. In late September — soon after the change of government in Australia — Wang had met with Payne, the newly enlisted foreign minister, on the sidelines of the United Nations General Assembly in New York. Wang expressed China’s willingness to mend ties with Australia and make the bilateral relationship “return to normal” under the Australian Morrison government. Wang also emphasized that China welcomes more Australian quality products entering into the Chinese market. On her part, Payne said Australia does not regard China as a military threat and welcomes China’s stepping up investment, according to Xinhua. However, while both ministers signaled a willingness to reset relations during the latest meeting, the differences between the two nations are also obvious. According to SBS News, before her visit, Payne had already promised to register “serious concerns” over China’s widely-criticized establishment of “vocational education and training centers” in China’s northwestern Xinjiang. At a press conference with Wang in Beijing, Payne said “We did exchange views on that matter” without giving more detail. While Payne was still in Beijing, Australian Prime Minister Scott Morrison announced that Australia will offer up to $1.45 billion in grants and loans for Pacific island nations to build infrastructure. This move was seen as “an apparent attempt to counter China’s influence” in the region, according to BBC. That move is likely to counteract some of goodwill generated by the Wang-Payne meeting. At the press conference with Payne, Wang also said that China and Australia do not necessarily agree on everything, but “we must always remain consistent between words and deeds” — seemingly implying discontent against Australia for not following that advice. Wang Yi's trip to Australia shows ever-closer ties between the two countries.